ROLET (Rollet), MARIE (Dufeu; Hébert; Hubou), daughter of Jehan Rollet, king’s gunner, and of Anne Cogu; m. first François Dufeu; m. secondly on 19 Feb. 1601 Louis Hébert (d. 1627) in the parish of Saint-Sulpice, Paris, and they had a son and two daughters; m. thirdly on 16 May 1629 Guillaume Hubou at Quebec; they had no children; d. 1649 at Quebec. 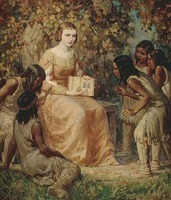 In 1617, with her husband and three children she came from Paris to Quebec, where she found starvation, sickness, and conflicts with indigenous people. A year after their arrival, says Sagard, the first marriage solemnized in Canada with the rites of the church took place, that of their daughter Anne and Étienne Jonquet. Anne died in childbirth the following year, but there is no record of the child. Marie Rolet aided her husband in caring for the sick and shared his interest in indigenous people, concerning herself especially with the education of their children. In 1627, at the baptism of Chomina’s son, Naneogauchit, which the priests were striving to make an impressive occasion, she fed a crowd of visitors from her big brewing kettle. Her name appears as godmother for this baptism and for the baptisms of many others who were converted. On 16 May 1629, two years after the death of Louis Hébert, she married Guillaume Hubou at Quebec. 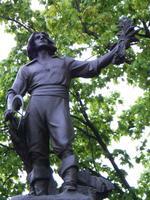 After seeking Champlain’s advice, she and her family (i.e., her third husband, her 15-year-old son Guillaume, her surviving daughter, Guillemette Hébert, and her son-in-law Guillaume Couillard) remained in Quebec during the English occupation and kept alive among their indigenous neighbours the memory of French friendship. After the return of the French in 1632, her house became the home of indigenous girls given to the Jesuits for training. She died in 1649, leaving her husband, her daughter, and a number of grandchildren. 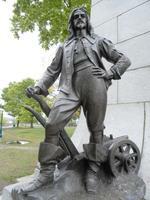 She was buried at Quebec on 27 May 1649. The spelling of Marie Rolet’s name was determined from her signature on a deed of sale dated 19 Feb. 1601 (see below). Arch. Nationales (Paris, Fontainebleau et Pierrefitte-sur-Seine), LL//958, 19 févr. 1601; Minutier central, XXIII, no.113. Bibliothèque et Arch. Nationales du Québec, Centre d’arch. 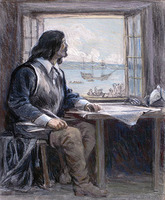 de Québec, CE301-S1, 16 mai 1629, 27 mai 1649. Ethel M. G. Bennett, “ROLET (Rollet), MARIE (Dufeu; Hébert; Hubou),” in Dictionary of Canadian Biography, vol. 1, University of Toronto/Université Laval, 2003–, accessed April 24, 2019, http://www.biographi.ca/en/bio/rollet_marie_1E.html.